A voucher to use at a gaming operator. No Depositing Limits on Vouchers! Vouchers are a popular way to make quick and easy deposits online and add to your gaming bankroll without any hassle. Of course, you will first need to find a voucher offer. The voucher itself includes a unique multi-digit/letter code that you can punch into the iGaming operator’s Cashier and make your deposit without the need to use a debit or credit card. It’s a great way to add an extra layer of security to your account and make sure that you will never lose any sleep over your financial information being imparted to third-parties. 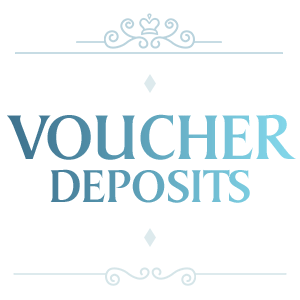 In our review we take a good look at what the advantages of depositing with vouchers are. In fact, let’s cut right to the chase here. Easy, convenient, and reliable. Cannot be used to withdraw money. Numerous safety mechanism in place. Available in low quantities. Transactions usually take no time and bar the small detour you have to make, finding a voucher, you will hardly have any trouble at all. Most importantly, though, you will be able to use vouchers as your payment option for a variety of gaming options, including mobile of course. In other words, as soon as you grab your voucher, you can use your smartphone or portable device to put it to use. Looking at the downsides of using vouchers, we can’t say that there’s much here. One of the bugbears is the lack of withdrawing option, but this is quite understandable as it would require exposing part of your financial data. Secondly, and rather more restrictive, is that vouchers are usually not worth much, although it would be silly to just snub the bonus money you can get this way. A voucher will usually be worth between $10 and $20 albeit you will eventually find amounts that are both lesser and greater than the ones specified here. Vouchers are also country or region specific, meaning that you may not be eligible to one in certain parts of the world. Your local operator may have adjusted certain promotions so that they only apply for certain players. When it comes to deposits, vouchers are quite straightforward to use, too. First, you need to check if your operator supports the desired payment option. It can be a bit of a hassle to actually find a voucher, we will be the first to admit. Once you do though, it’s quite easy to verify. Simply log in with your account information and head over to the Cashier. You will be asked to enter your code upon which the amount will be credited to your account. Vouchers consist mostly of letters, digits or a combination of both. They are not unnecessarily complicated or long-winded, so it’s easy to enter. As already clarified, your deposit will appear in your bankroll immediately. We recommend vouchers, because they are an amazing way to prop your bankroll, and most operators will even provide additional treats on top of their regular offers. Vouchers often come with no depositing limits. Meaning that if you acquire a handful of those, you can use them to build up your bankroll. This may be a bit of an unlikely scenario, though as they are particularly difficult to get hold of. The stocks are usually limited, too so beware and possibly – hurry up! Why check our mailbox at iGaming operators? Easiest way to keep track of any significant changes. An excellent way to find out about new promotions. If you want to increase your own chances of getting a voucher, you may appreciate the internal mail system a iGaming company uses. There, you can get hold of the latest promotions and upcoming special offers that you can benefit from. Vouchers are elusive in nature, but it is definitely worth developing a habit of checking what an operator can offer you. A voucher may or may not have a rollover requirement. Either way, we see this as a positive development. In the case where you have to deal with a playthrough proviso, you will quickly find out about the importance of reading carefully through the T&C of each individual promotion you accept here. Conversely, lack thereof makes things even simpler for you, as all you need to do is bet on any event you like. Even in the cases where there are wagering requirements, though, they are usually quite feasible, and you will be able to clear them in the course of normal gameplay, without having to go to any lengths. Vouchers are perfectly safe. As they come from the operator directly, you will be even more confident in snapping one up when the opportunity presents itself. Even though the monetary incentive isn’t as great, you will benefit from building your loyalty with the iGaming venue. The code you enter also tells the operator a bit about your habits and it signals the company that you are following its offers. With this in mind, you may be on the receiving end of more generous bundles and one-off specials. The more you play, the more likely you are to become one of your operator’s most valuable clients and with this come the extra freebies, such as vouchers. Reload codes and many more. All of these are slightly different, and they will vary across operators. It’s important to pay attention to each individual promotion’s specifics. Vouchers are surprisingly easy to use. Because of this quality, players always make sure to claim every single last one of them, even though it may take some time & effort to do so. Overall, though, you only stand to benefit from vouchers, which is one of the many treats that iGaming venues offer their customers. We have covered those neatly for you. Vouchers are a popular way to make quick and easy deposits online and add to your gaming bankroll without any hassle. Of course, you will first need to find a voucher offer.